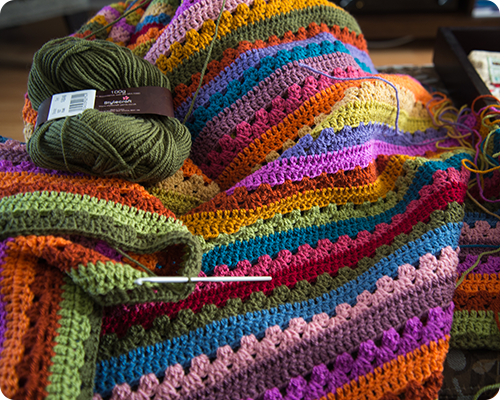 Hi Rachel, this blanket is coming along so beautifully! I love the same thing about making a blanket, being able to snuggle underneath as you work. It's wonderful. You're making great progress, I think you really could finish by Christmas! Thank you...and you are right, my family will be very happy to snuggle underneath this blanket. Great time to be making this blanket eh? Love all the colours you are using. It is the perfect time of year to be making this blanket since the weather is getting colder. Thanks so much for reading. Thanks for the cheers Gracie! Thank you Jo. The greens in this blanket are some of my favorite colors, along with the blues and the orange; all in all it is a happy collection of colors.